In April's #Girlcrush box I received this foam toothpaste by pure smile and as soon as I saw it I just knew I had to use it. I've never heard of a foam toothpaste before so this concept is really new to me but I wanted to test it out and see what the results would be, and that's why today's post is a review all about this amazing product. I have been using this foam for around two weeks now, maybe a little over and I have to say that the difference I not only see in my teeth but also feel in my mouth is AMAZING. 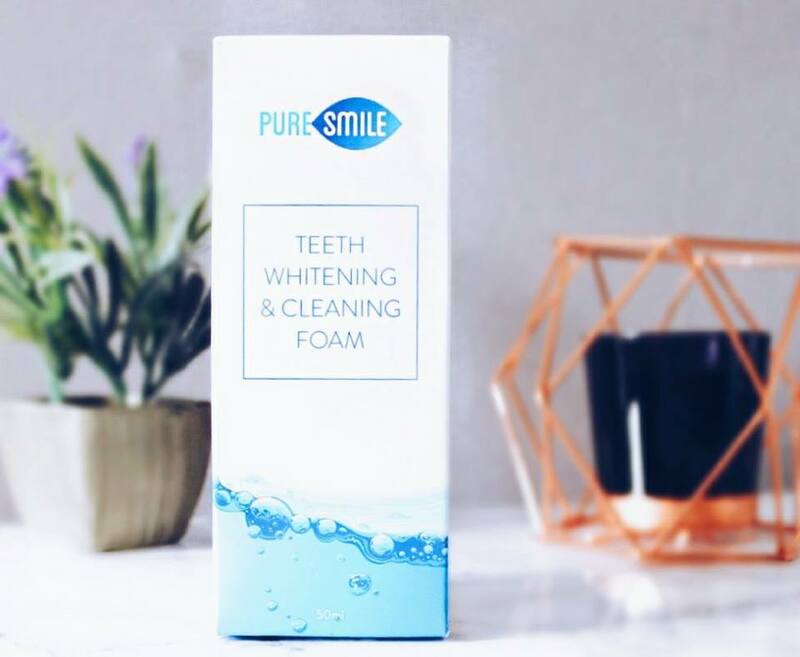 It's a teeth whitening and cleaning foam which you use twice a day just like any regular toothpaste, you pump it onto a dry toothbrush and away you go. The first thing I noticed about this stuff was the taste, I really can't describe it in words other than it tastes like something you would get at a dentist office but it's really nice and refreshing. My mouth always feels so clean after using this stuff and I don't need to worry about bad breath etc... since using the foam I've noticed that I've had more confidence in my smile because my mouth really does feel clean and my teeth look noticeably better as well. The taste of this stuff is by far my favourite thing about it and I've found myself brushing three times a day sometimes just so my mouth can feel clean and refreshed throughout the day. It's not an overpowering foam like some toothpastes can be, it's quite mild but it does the job rather well, leaving you feeling amazing and ready to smile all day long. At first I was a little sceptical about it though because of it being a foam I didn't really think it would act like a toothpaste and last for the full two minutes, I thought it would kind of disappear if that makes sense? But I found that it foams up even more whilst brushing and this really helps me feel like my teeth are getting a proper clean. I would say my teeth have definitely gotten about two shades whiter since using this, it's really helped boost my confidence as my teeth have always been a major thing for me and stops me smiling as much as I feel they always look really dirty, even though my gran says that it's all in my head, but since trying this out I really do see a difference with my nashers. All in all I'm really impressed with this foam by pure smile, it's a fab product that I will most definitely be buying because it's one of the only things I've felt really work for my teeth. If you ever have the pleasure of using this then I'm sure you'll love the taste, I know I do!